After five years of transitioning to a fully Division I (D1) athletic school, UMass Lowell’s 2017 Homecoming was not shy of celebrations for every River Hawk. Riddled with athletes, faculty, administration, alumni and friends of the university, Rise Up! was a celebration of sports that highlighted the many accomplishments of the D1 teams as well as the new inductees in the UMass Lowell Hall of Fame. On Oct. 12, the university celebrated all the River Hawks, past and present, for their athletic accomplishments as all D1 sports teams enter National Collegiate Athletic Association (NCAA) completely, meaning all teams can now compete in NCAA conference postseason competitions and playoffs. Rise Up! brought together new players with old, faculty with alumni, and students with a love of sports. 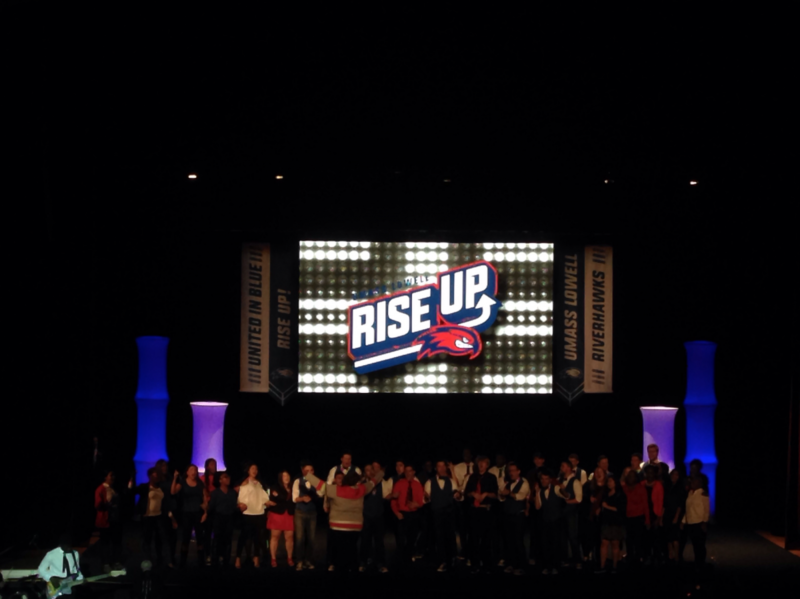 A continuing theme throughout the evening was replaying the song “Rise Up” in different arrangements, including on featuring Hawkappella, Vocality and the UMass Lowell gospel choir. Dana Skinner, the UMass Lowell athletic director, kicked off the event by introducing what the event was about by thanking the athletes, coaches, administration, the athletic department and several others who helped with the transition. He concluded his statement by reading the letter from the NCAA board that arrived late-August stating their full transition. He read it aloud with Chancellor Jacquie Moloney. Moloney took to the podium and spoke about the NCAA representative who spoke to her prior to the transition about the university’s uniqueness in terms of its growth and dedication to athletics. “It’s in the huddle where race doesn’t matter, economic background doesn’t matter, sexual orientation doesn’t matter; nothing matters except coming together as a team and working together towards a common goal,” said Niles. In light of the miracle of the huddle, the first inductees into the UMass Lowell Hall of Fame were the 2005 field hockey team, who defied all odds and won their D2 NCAA national championship. Not only was this the first major win for the team, but they were the first women’s team at UMass Lowell to win a national championship and one of the first to win one in the university’s history. Other inductees followed including Jeff Daw, an ice hockey player from the 1996 season, Julia Barrett from the track and field team of 2010 who won an NCAA national championship for shotput, and Ruben Sanca, member of the track and field team who went on to become an Olympic athlete and champion in the 2012 summer Olympics in London. All inductees feel a special connection to UMass Lowell and acknowledge the impact that sports had on their lives. They all said they feel incredibly honored for this prestigious award and are truly proud to be river hawks. “To be a River Hawk means to never really give up. It’s to carry a chip on your shoulder and going into every game or every race thinking that you are an underdog and trying to prove yourself,” says Sanca.